Turn your static garage set into a functional, fully mobile unit with the newly designed Performance Plus 2.0 Series Mobile Spacer Kit. The kit includes a heavy-duty, fully welded Wall Spacer Cabinet and a Worktop Spacer Tray that attaches to your Wall Cabinet, Locker and Worktop. This allows for your Base and Tool Cabinets to easily slide in and out of the configuration with added space in-between cabinets, creating a floating worktop. Keep your cabinets close by while you work with the Performance Plus 2.0 Mobile Spacer Kit. This shoe cabinet is a contemporary piece ideal for re-organizing any space. With multiple roomy shelves, hidden behind gorgeous slatted doors, your new cabinet can hold up to 12 pairs of your favourite shoes. The rich, multi-tonal finish complements existing dicor seamlessly and the modern shape will never lose its appeal. Welded and ready to hold a ton, the NewAge Performance Plus Diamond Plate 20 gauge steel Cabinets work hard to help you play harder. The Performance Plus Diamond Plate 2 Door Base Cabinet features total durability and maximum storage space -- everything you would expect out of a top-of-the-line cabinet solution. The Base Cabinet arrives fully welded, so cabinets are easy to install and can endure the roughest of conditions for decades to come. Get all those cables, decorations, and gardening tools off your garage floor and into NewAge Products newly redesigned, Performance 2.0 Series modular garage cabinetry. These cabinets are built to last with their fully welded, 24-gauge steel frames and fully lockable, double walled doors. 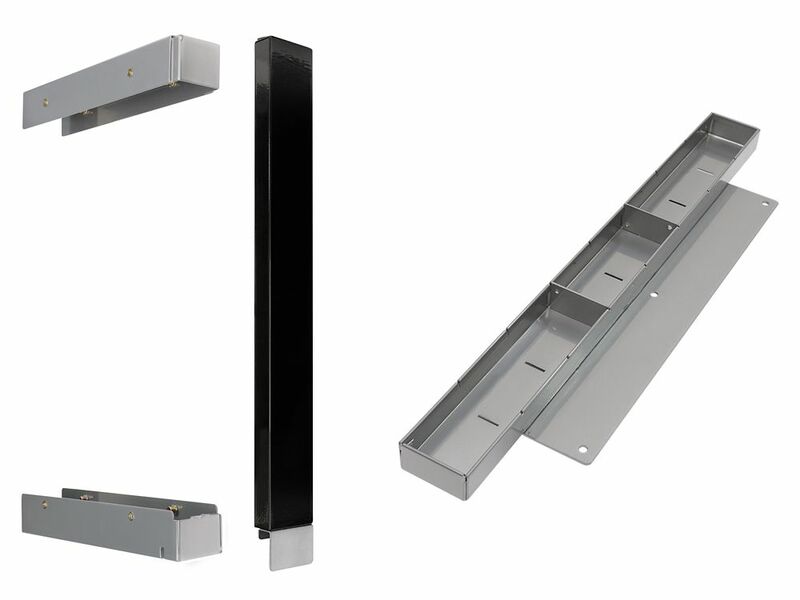 Our configured sets are shipped with adjustable steel shelving; easy-to-grab stainless steel handles and height adjustable leveling legs that accommodate uneven garage flooring. The manufacturers limited lifetime warranty gives you the insurance that your cabinets will look great for years. The Performance 2.0 Series Extra-Wide Locker was designed with maximum storage in mind and has 3 easy-to-adjust shelves that provide customizable storage for items of all sizes. With a complete high-gloss powder-coated paint finish inside and out, this Locker is scratch-resistant and ready to stand up to the toughest garage conditions. The Extra-Wide Locker requires full-assembly and is lockable to keep your gear secure. Performance Plus 2.0 Series Mobile Spacer Kit in Black Turn your static garage set into a functional, fully mobile unit with the newly designed Performance Plus 2.0 Series Mobile Spacer Kit. The kit includes a heavy-duty, fully welded Wall Spacer Cabinet and a Worktop Spacer Tray that attaches to your Wall Cabinet, Locker and Worktop. This allows for your Base and Tool Cabinets to easily slide in and out of the configuration with added space in-between cabinets, creating a floating worktop. Keep your cabinets close by while you work with the Performance Plus 2.0 Mobile Spacer Kit.